Speaking before a plenary session of the Catalan Parliament, the president announced that he and Vice President Aragonès will travel to Madrid this weekend to visit the political prisoners. The president also lamented the “indecency” and “wretched conditions” of the political prisoners’ transfer to Madrid. He announced that this weekend he and Vice President Pere Aragonès will visit the prisoners “to see them, encourage them, give them strength, and find out more about what’s going on”. Responding to a question from the Catalan Republican Left (ERC) group, the president said it was “appalling” to live in a state that “has pulled out all the stops to spread fake news” and that, “in response to the failure of brand Spain”, has created “specific bodies to do just that”, such as España Global. “The biggest fake news we’ve had to tackle in recent months is the attribution of violence to the independence movement, which has landed our colleagues in prison or forced them into exile,” Torra said. According to the Catalan president, this false narrative is a “state operation” that “we have to stand up against so that it doesn’t prevail”. 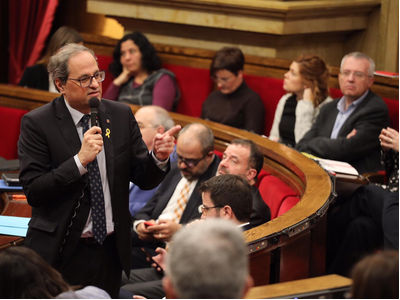 In response to a question from the Catalunya en Comú–Podem group, the president also commented on the second meeting of the Espai de Diàleg (“Dialogue Space”), held yesterday at the Palau de la Generalitat. He said the meeting of the cross-party group demonstrated a commitment to “transparency and trust” and “our responsibility to set out both what the Spanish state proposed to us and what the Government of Catalonia has proposed”. Torra said that the participants’ contributions made the meeting “a forum for dialogue that was more organised and structured, and a space for in-depth discussion”.